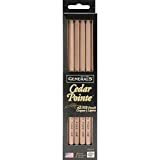 This box of 12 General Cedar Point Pencil is made exclusively from top quality California incense cedar. All General Pencil leads are waxed and bonded to meet the most strict quality standards, and they maintain their point for less frequent sharpening. HB Hardness.